Pro-MMP-2, mouse | 7780 | BioVision, Inc. The progelatinase A, a member of the matrix metalloproteinase (MMP) family, has been isolated from macrophages and fibroblasts. Gelatinase A hydrolyses several components of the extracellular matrix, e.g. the collagen types IV, V and XI and gelatin. Progelatinase A complexed via their C-terminal domain with TIMP-2 was isolated from culture media of different cell types. This complex shows both properties of its constituents: Like TIMP-2 it inhibits active matrix metalloproteinases and like gelatinase it shows proteolytic activity after activation with APMA (4-aminophenylmercury acetate). However, its proteolytic activity is less than 10% of that of gelatinase A not complexed with TIMP-2. In contrast to the other MMPs the progelatinase A cannot be activated by the serine proteinase trypsin. Until quite recently a potential natural activator that can transform latent progelatinase A into the active form was unknown. 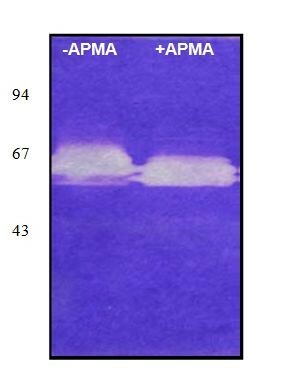 It was shown that the catalytic domain of the membrane type 2-matrix metalloproteinase activates progelatinase A as well as the progelatinase A / TIMP-2 complex, by cleaving the 72 kDa progelatinase A to yield 67 kDa gelatinase A, which is than transformed into 62 kDa gelatinase A. The 62 kDa form is about twice as active as the 67 kDa form towards the Dnp-pepitde (Masui et al.). No significant difference in activity was found between free and complexed gelatinase A forms.